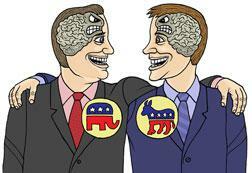 Partisanship is one of the illnesses plaguing the U.S. body politic. We see this every election cycle as millions of voters cast straight-ticket ballots for candidates just because of the capital letter before their name. Voting records will be ignored. Rationalizations and excuses will be made. Bromides on how we must accept the “lesser of two evils” will be shoved down our throats. Unbeknownst to many of these zealots, their steadfast devotion to the political establishment “right or wrong” is indirectly enabling the political class’s malfeasance’s. Incentives matter in politics, and it would behoove us to recognize that. People often believe politicians are superhuman, but deep down they are still mortals. In fact, politicians behave like Pavlovian dogs who respond to external stimuli such as pain and pleasure. In this case, voter pressure is the key stimuli. When politicians can consistently count on support from voters, they will run roughshod over our rights. Every ill-informed vote cast for establishment politicians is a green light for them to do as they please. And when the same politician drops the ball legislatively, those who voted for him will not utter a peep. Such voter conformism is common in so-called “small-government” Republican circles. Sadly, it has been enabled by one of the movement’s golden boys—Ronald Reagan. The Eleventh Commandment, which Reagan popularized, states “Thou shalt not speak ill of any fellow Republican”. Since Reagan popularized this concept, a toxic environment of conformism and tolerance for preserving the status quo has emerged. If Republicans can’t be criticized for living up to their campaign promises, how can their ideas become implemented? Any successful movement must have standards. The strategy of conservatism driving the speed limit can only go so far. When you start compromising and growing the size of government, it only emboldens the big government advocates on the Left. They are never satisfied and see any “Constructive Republican Alternative Proposal” (C.R.A.P) to grow government as a half-measure. Rest assured, they will dial up the statism and then some. Give the statists a foot, and they’ll eventually take the whole mile. To be fair, partisanship isn’t just confined to Republicans. Democrats also suffer from the same problem on issues such as drug liberalization and foreign policy. As the supposed champions of minorities and other marginalized constituencies, Democrats have lagged for decades on issues such as marijuana legalization. Over the past few decades, marijuana prohibition has led to the mass incarceration of millions of their constituents. In light of this alarming trend, Democrats did next to nothing, and in some cases, ended up prosecuting the drug war themselves. Many Democrat voters along with numerous independents had enough of the Democrat’s inaction on the drug issue and turned to ballot initiatives to make marijuana legal in 9 states. Vermont is the only exception to this trend given that it was the first state legislature to legalize marijuana. On the foreign policy front, Democrats have completely conformed to the D.C. foreign policy status quo. This has been their modus operandi since day one. Historically, Democrats started conflicts such as World War I, World War II, the Korean War, and the Vietnam War. In present times, Democrats are now fuming over Donald Trump’s decision to pull troops of out Syria and begging for conflict with Russia. This is a far cry from the 1960’s leftists who protested the Vietnam War and the anti-war Left that was present during the Bush years. When Barack Obama was elected in 2008, the anti-war Left did its best Houdini impression on the war issue. As is the nature of partisan politics…. In present times, Democrat firebrand Tulsi Gabbard is shaking up the political scene with her announcement to run for president of the United States. Gabbard is receiving all sorts of backlash due to her deviation from the Washington foreign policy consensus and other trivial views she held in the past. Nevertheless, Gabbard’s presence poses a major threat to legacy Democrats. For that reason, the establishment is working tirelessly derail her. Ruffling feathers is essential for breaking free from the status quo. Playing according to partisan rules is the reason why we have a bloated welfare/warfare state in the first place. It’s time to shake things up a bit. At the end of the day, grassroots pressure and a willingness to go to war with the political establishment are key. Inertia is the greatest force in politics, and without the external pressure, the status quo of big government persists. If we are not willing to kill sacred cows in the two-party system, nothing will change.